In the last 10 years, Richard Fahey has been one of the most active trainers in the UK, with over 11,000 runners. With such a busy schedule, it makes his 12% strike rate all the more impressive. Fahey is adept at training all sorts of runners and the Malton handler has shown his prowess at the top level, amassing 30 Group One winners in the UK and around the world. In this article we try to see any biases as regards Fahey’s performance in certain race types and with horse’s ages etc. 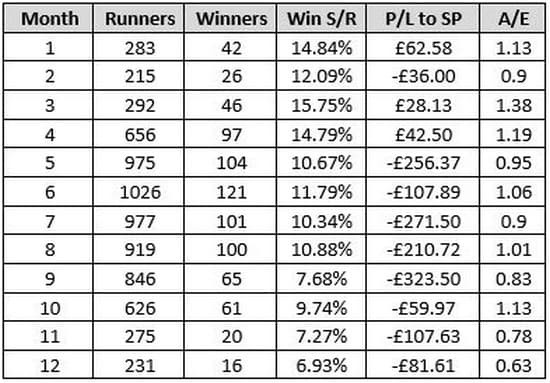 With such a large number of runners, there should be some solid and reliable trends which can provide useful direction when deciding whether to back Richard Fahey runners. One thing Fahey is renowned for, is getting his season off to a flying start with his young horses. While many trainers struggle to get their juveniles sharp enough to score at their first attempt, Fahey has mastered the skill, particularly in the early part of the season. From March to June, he is red hot, with a record of 62/311 (20%) for £90 LSP and an A/E of A/E 1.46. As the season progresses, his performance wanes in terms of strike rate, but he is still profitable in some months. From July to October, the Malton handler is 27/288 (9.38%) for £10 LSP, giving a respectable A/E of 1.0. He only has a limited number of 2 year old debutants in November and December (when the turf switches to the all-weather), but again, has more winners than the odds suggest he is entitled to. Interestingly, although Richard Fahey is prolific in 2 year old maidens (especially on debut and over the minimum trip of 5f), this success is not replicated with his 3 year olds. Scouring through the records, there were far fewer 3 year old debutants, and they had a modest record indeed – 7/106 (6.6%) for loss of £-44. A/E 0.70. Perhaps his runners garner a significant amount of benefit from their first racecourse outing and are profitable second time out? No. In fact, their record is even worse, at just 3/116 for loss of £-93. A/E 0.25. In essence, Fahey first or second time out 3 year olds generally make very solid laying opportunities. Why are the results so positive? Well, as evidenced by his success with debutant 2 year olds, Fahey can ready his horses at home to do themselves justice on the racecourse. This isn’t always reflected in the market and as such, they started at inflated odds. The handicaps in the early part of the season aren’t usually competitive as there are typically a number of runners returning from their winter break, many of whom are not 100% fit. It is generally assumed that all weather races are easier to win than turf contests. All weather action is often low grade with a limit on the field sizes. Surprisingly, although the strike rates are about the same on both surfaces, Fahey has a better record on the turf. His all- weather runners have a reasonable win record in terms of percentage, but an A/E of 0.92 isn’t fantastic. 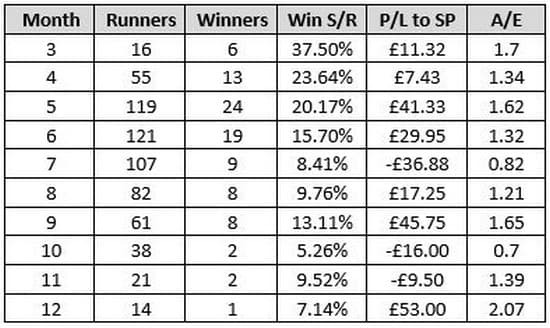 When looking at the results from the runners from class 3 & 4 combined, the figures aren’t great – 43 winners from 390 runners (11%) for a loss of £-187, giving an A/E of 0.70. For his horses who were turned out within 3 weeks of their victory, the stats are even poorer – 26/256 (10.2%) for a loss of £-141 and an A/E of 0.62. Given that the horses have won recently and therefore should be in good form and very competitive, the results are poor and suggest that Fahey has them ready to win once and there isn’t always the improvement that the market expects next time out. March to May is the time to back Richard Fahey first time out 2 year olds. His 2 year old debutants excel over 5f and get worse as they go up in trip. He does well in nursery races with runners who have several runs and competed in a nursery last time out. Maiden to nursery switchers have a moderate record. Don’t back Fahey’s first time out or second time out 3 year olds – they have a very poor record. His 3 year old+ handicappers returning from an 8+ week break have a fantastic record in March-April, the trainer has a real knack of getting them fit at home. Their performance declines over the year and is poor in November-December. As a general rule, Fahey’s horses are better value on turf.